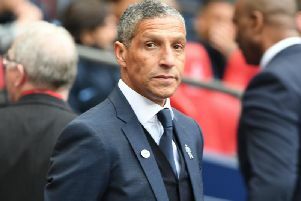 Brighton manager Chris Hughton is targeting a return to winning ways when Huddersfield visit the Amex on Saturday. Albion have lost their past three games 2-0 but are still 13th in the Premier League and six points clear of the relegation zone. Huddersfield head to Albion after picking up just one point from four games and, on paper, it looks Brighton's best chance of picking up a much-needed win to ease any worries of the drop. Hughton said: "We’ve got a group that’s been up for the challenge all season. Around that, there have been some good performances and some not-so-good performances. "Probably what I would say about our recent form is that away to Everton, we didn’t deserve to get anything out of the game, but anybody seeing our last two performances away at Manchester United and at home to Leicester, you couldn’t fault the performances. "We are off the back of an unjust result against Leicester, but what you have to be able to do is score goals to win games. "This is a really good opportunity to return to winning ways." Midfielder Dale Stephens is still a doubt for Albion but Leonardo Ulloa is set to return to the squad after missing the Leicester game owing to the loan agreement with the Foxes. Winger Anthony Knockaert serves the last game of his three-match ban.